Alex Ross has a new My Favourite Records thread which starts with Björk's choice. So I am entering into the spirit of things by sharing the eight favourite records that Elisabeth Schwarzkopf chose when she appeared on the BBC's Desert Island Discs in July 1958. 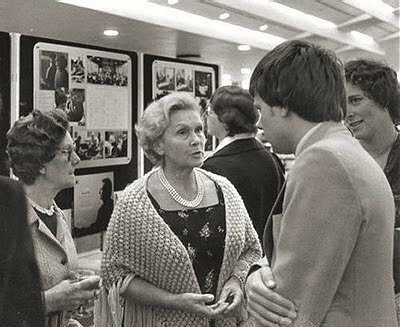 In the photo above I am talking to Elisabeth Schwarzkopf in 1979 at the Royal Festival Hall. Here are her favourite records. In the Desert Island Discs interview Elisabeth Schwarzkopf said she did not watch very much Youtube, but nominated this as her favourite video. The story behind that header photo is here.